I’ve never liked the term “I am too busy”; it felt fake or dishonest. 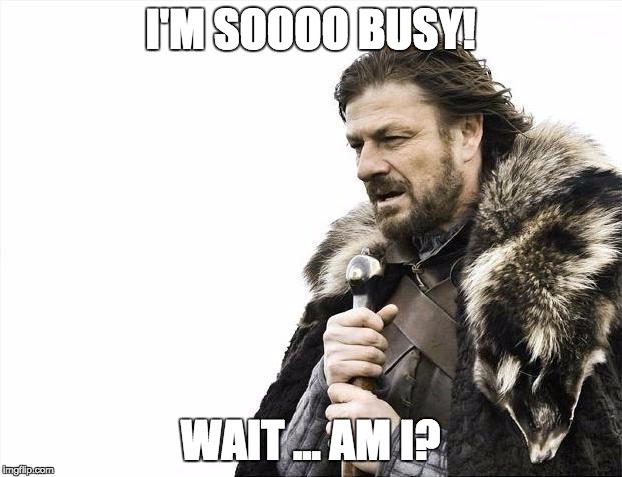 “Busy” for me implies a loss of power and responsibility. “Busy” feels like something that happens to you. So… what if this whole time, you never were busy? What if this whole time, you were making choices relative to your time? What I love about the “reframing of busy” is that it makes you present in every single moment. I believe that this gives us a key to have a more complete control of our lives – even if that doesn’t appear to be the case. On a final note, I am not going to pretend that I don’t get overwhelmed or overburdened! Quite the contrary, we all experience that. The blog is to share this new experiment that I believe to be quite useful! So that’s it folks. If you find this interesting try it out and please let me know how it works out for you. As usual, please leave comments, let me know what you think! ps2. Thanks to Brenna for the suggestion on the title! ps3. I just discovered “meme generator” to create images for content. This is an interesting post. You’re right- it’s a significant point of power when we realize we have the choice, most of the time, in how we spend our time and life energy. Becoming aware of this choice might be scary at first, though. Suddenly, you realize you can say no to things- a lot of folks aren’t comfortable doing that. How do you say no in a way that feels assertive and positive? Looking at how we spend our time and being honest about how that makes us feel could also bring up issues of identity and the roles we play. Are we living in alignment with who we actually are, or who we think we should be? These could be interesting questions to explore. I would say, that when you want to say “no”, the best appraoch is to stay as “objective” as possible, and move away from the emotional/guilty. e.g. “That time is already dedicated to something else.” or “I have allocated that time to something already.” (or whatever wording you want) Also, no need to justify or to give excuses. I find people (including mylsef) take it less personal that way. That being said, some people could take it the wrong way, in which case that’s out of your control, in which case I guess the game is “try not to worry about it?” Easier said than done of course. And yes agreed with the living in alignment part! Great comment Elsa! Je vais définitivement essayer d’introduire ce ‘rephrasing’. Je pense que non seulement ça permet de réaliser qu’on choisit comment on gère notre temps/qu’on est en contrôle de notre vie, mais ça peut également permettre de regarder objectivement comment ont priorise notre temps… et de faire des changements si on n’aime pas ce qu’on réalise! I work in a profession that wears exhaustion like a badge of honour. I used to be proud of how I could push through no sleep, or keep going on sugar and caffeine alone. Then I experienced a personal upheaval that drained my already empty tank and I was forced to challenge the assumptions I had been living under. A junior colleague I hadn’t seen in a while asked me “How are you? Crazy busy, eh?” I knew what was expected. Agreement and commiseration of all the directions we’re pulled in and how exhausted we are with the unending demands of work. But I paused and said, “No, actually. I am just as busy as I want to be.” She looked confused. I continued: “I’m really enjoying the work I’m doing and I’m really enjoying having time to do other things outside of work.” I thought it was important to challenge that expectation that if we are not “crazy busy”, we are not doing enough or being enough. When I work, I work hard. I am dedicated and proud of my work. But I also love giving myself and others permission to not have to fully empty ourselves out. Permission to choose a life that is fulfilling on more than a professional level. Thanks for you post, Mathieu – and for challenging the assumption that “crazy busy” is an honourable goal and for reminding us of the choices we each make in creating the lives we live. Very true. And thanks for sharing! These things are tough to do. For me, one of the reasons I love this blog is that I find it’s good to share and you get other people to share back (like you). Talk soon!